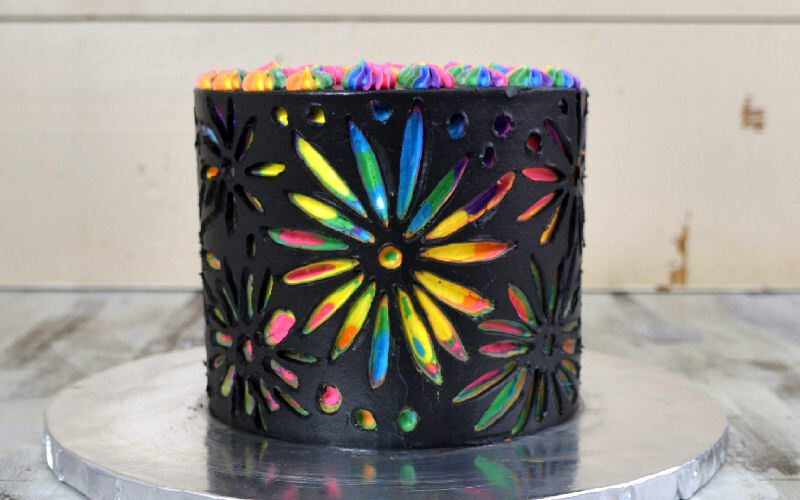 I had this fun Rainbow Flower Scratch Art Cake on my mind for several months. Remember scratch art from the grade school? It wasn’t too hard was it? 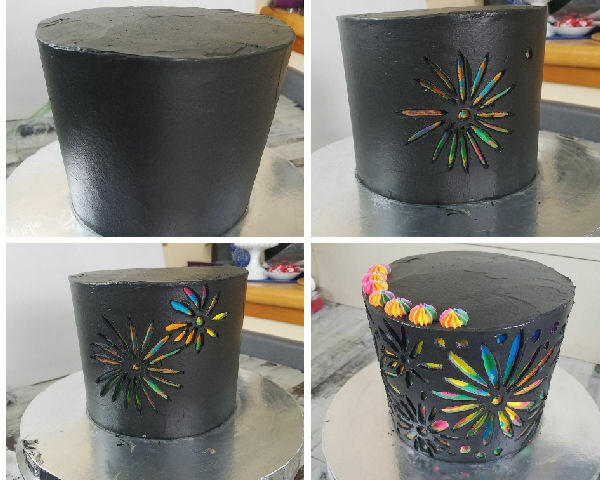 Well, I combined scratch art technique with pottery carving and that’s how we are going to make this cake. Last month I finally ordered new pottery tools. I whipped up Swiss buttercream and baked 6 inch cakes. 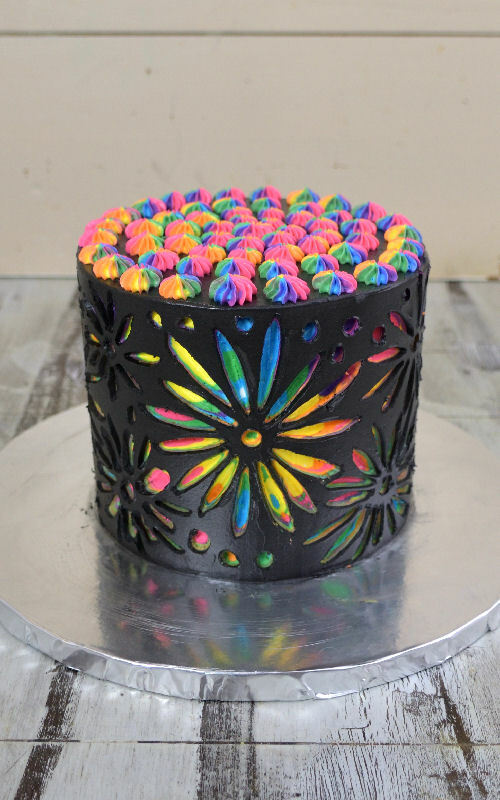 And I made a Rainbow Flower Scratch Art Cake. This was my first attempt and it turned out so colorful and really pretty. I hope you like it as much I do. You can use any cake you’d like. I baked chocolate cake layers so I used those. Some of the folks on social media suggested rainbow layers to match the outside. Be creative and have fun. I used Swiss Buttercream to fill and ice the cake. 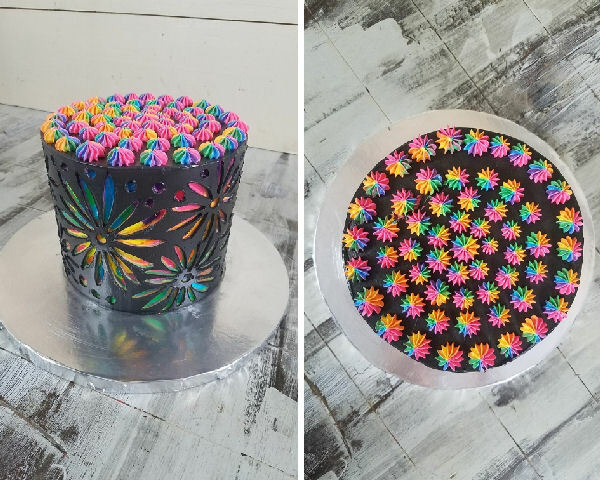 I recently shared a post on Coloring Swiss Buttercream if you wanted to check it out is there. But in a nutshell I heated 1/4 cup buttercream with the food coloring for about 5-8 second. 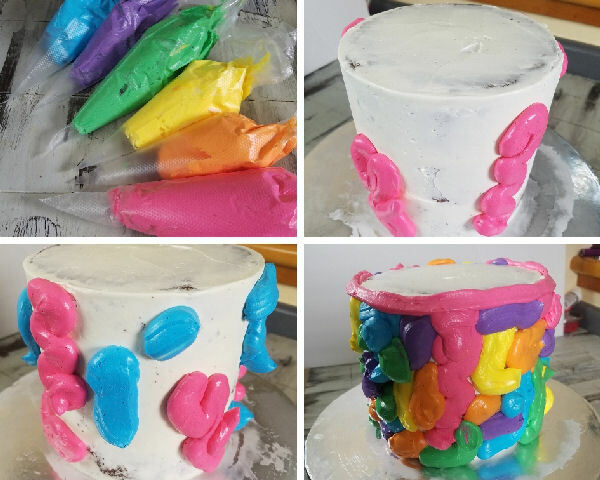 Then I thoroughly whisked the slightly melted buttercream until well combined and immediately poured the colored portion into the buttercream I wanted to color. Heat really helps to activate the color pigment and you’ll be able to reach deep color tones. Repeat until you reach the desired color. 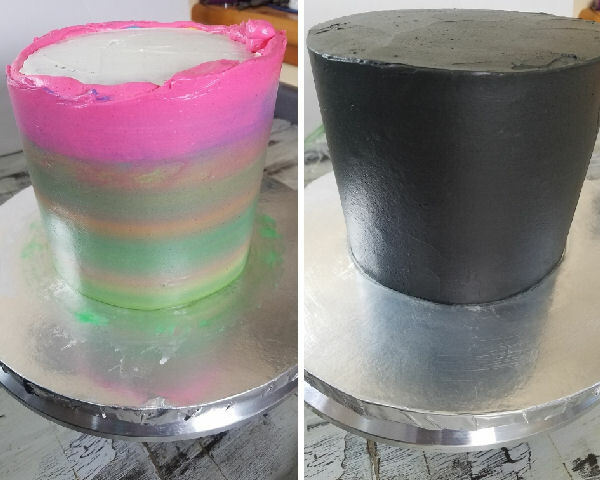 To make Black Swiss Buttercream – to color approximately 3 cups uncolored Swiss buttercream I used 1/4 cup cocoa powder and black food coloring. You can either use Black Cocoa Power or Dark Cocoa Powder. I heated 1/4 cup uncolored buttercream with black food coloring first then I stirred in cocoa powder and then I added the mixture to the uncolored buttercream. 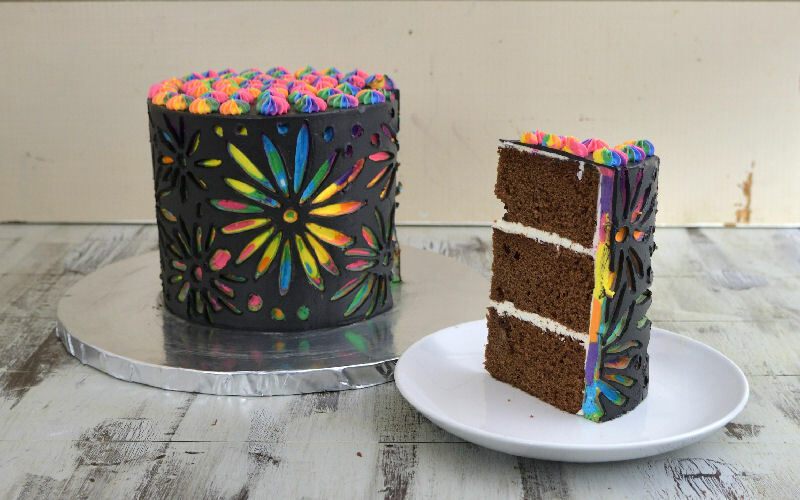 Refrigerate cake after each buttercream layer. 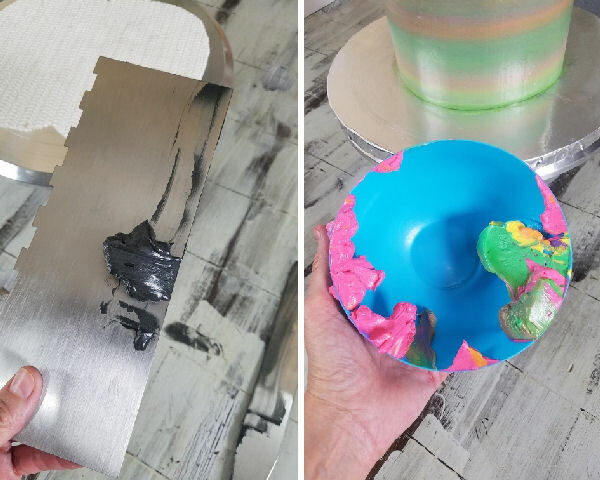 When adding black layer, make sure you are adding a thin layer, you don’t want it to be thick. It is important to chill the cake well before carving, and in between as needed. Have a bowl with hot water and a clean dry paper towel on hand. Keep the pottery tool tip clean and slightly warm. You can submerge it in the hot water for 15 -30 seconds. Any longer and it may get too hot to handle. Rinse the tip of the pottery tool after each time you carve the buttercream to remove buttercream residue, quickly dry it by dabbing it on a dry paper towel. Continue carving. To make the petals I used a tool with a little nose shape, for the centers I use a round tool. 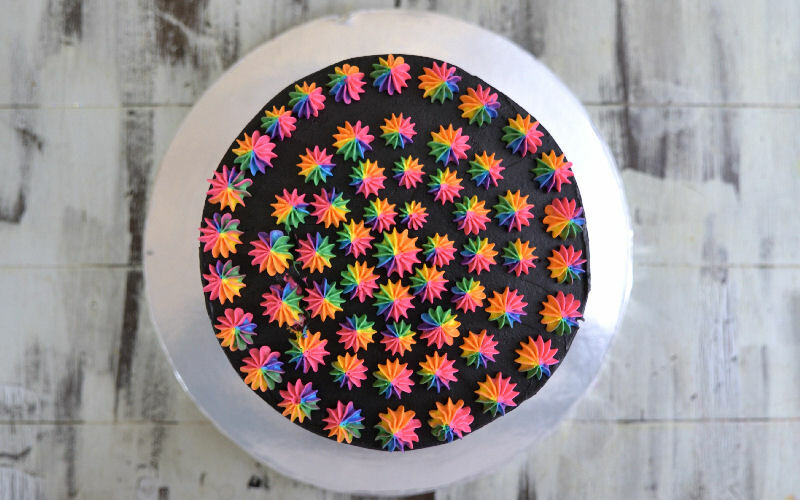 Rainbow Buttercream swirls or stars are super easy to make. 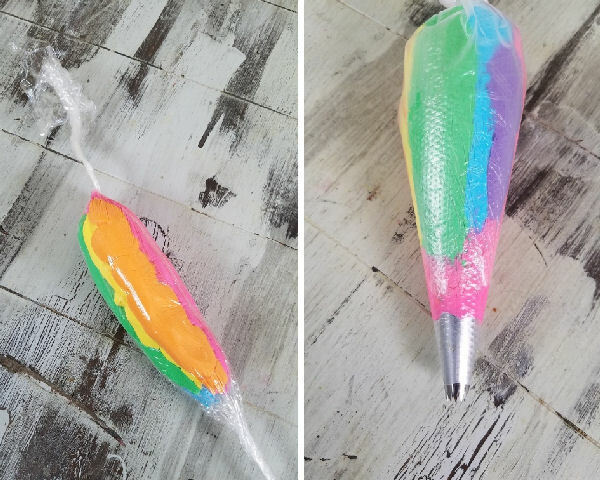 Layer rainbow buttercream onto a plastic wrap. Form a pouch. 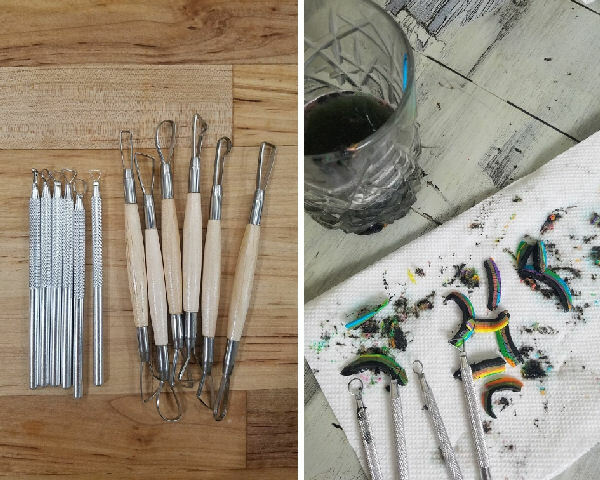 Fit a piping bag with a star tip, insert the pouch into the piping bag and start piping pretty rainbow stars. Hi have you tried making one in a stained glass style?